The history of the Shasta Tribe, by Betty Hall, Pioneer Press, posted to KBC 12/17/09. 1905, "Parties coming in from Keno state that the run of salmon in the Klamath River this year is the heaviest it has ever known". The article also states that there is a natural rock barrier below Keno, which it is almost impossible for the fish to get over, should some succeed they are spotted, bruised, and are worthless. Evidently salmon getting to Link River was not a common occurrence, as to the statement made above." 3 environmental groups joins forces to speed up Klamath dam removal, KDRV, posted to KBC 12/17/09. "The group also opposes commercial agriculture on the 22,000 acres of National Wildlife Refuge land currently leased to farmers in the Basin, and wants better protections for endangered fish runs than are provided in the KBRA." Clock ticking on Klamath dam deal signing, Times Standard, posted 12/17/09. "The deadline to sign the agreements to tear out the Klamath River's four main dams is only a month away"
Water Deal would require major expenditures not previously disclosed, by Felice Pace, from Philadelphia, founder of Klamath Forest Alliance, owner of Klam Blog, 11/6/09. (KBC NOTE: An environmental activist's take on the KBRA). Humboldt Supervisors put support behind Klamath dam deals, Times Standard, posted 12/3/09. "A deadline of Jan. 14 is set for all parties to sign or oppose the agreements." Sink the pork laden (Calif) water bond, Press Enterprise by Assemblyman Jeff Miller, posted to KBC 11/30/09. "...$250 million for dam removal on the Klamath River. That's right: removal, not construction...the Capitol reverted back to many of its troubling habits of secret deal-cutting and last-minute changes to seemingly settled legislation. Sometimes, we fundamentally forget to make certain that we have asked for -- and received -- the consent of the governed." (Siskiyou) supervisor says science matters to (Klamath) debate, H&N 11/20/09 Klamath Dam removal: A model for the future, H&N 11/20/09. "U.S. Rep. Tom McClintock, R-Calif., said it’s “insanity” to get rid of the cheapest power available when Californians are already paying some of the highest energy prices in the country...McClintock discounted statements that the negatives of dam removal are outweighed by the benefits...'That is ideological claptrap from the lunatic fringe of the environmental left...There are other measures possible to improve fisheries, such as building and funding hatcheries' "
Lawmakers mull next steps after water forums, H&N 11/20/09. "Nearly everyone spoke against dam removal and the restoration agreement." KBC NOTE: that is incorrect; no one supported the KBRA and dam removal, not one. Residents sound off at KHSA meeting, Siskiyou Daily 11/20/09. "About 200 people in total attended...the meetings....only one person held up his hand in support of (Klamath Dam) removal." 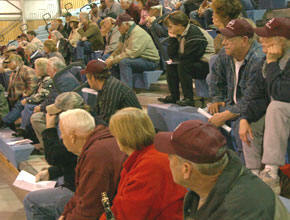 Water issue debated at separate forums; opponents suggest other options, posted to KBC 11/18/09. KBC Note: Proponent of the KBRA complain that the public, who has been banned from negotiations, has no solutions, so they justify this closed-door agreement that excludes public input. However, the first meeting in 2 years was held entirely for public input Tuesday, Klamath Water Users, Upper Klamath Water Users, Tribes and PacifiCorp boycotted it, refusing to hear the people. “We just decided that wasn’t going to be a productive use of our time,” KWUA director Addington said..."We have to be done (with the agreement) first." Mitigating impact of dams on the river, H&N, posted to KBC 11/18/09. (KBC Note: Tucker, contradicting Riverkeeper, is a founder and board member of Riverkeeper.) "
Commissioner plans to support deal, H&N, posted to KBC 11/17/09. “Even the Declaration of Independence had its detractors,” Elliott said, referring to those opposing the KBRA. Dam removal bond bill gets signature, H&N posted to KBC 11/16/09. (KBC NOTE: Just a reminder that Klamath Water Users Association, tribes, gov't agencies and environmental groups have heavily lobbied for the bonds for taxes and power rates to pay for tearing out Klamath River hydro dams. However, your representatives justify boycotting the public listening session on dam removal and the KBRA, saying they want the agreement done first before they hear the people's wishes and concerns.) Closed meetings: Good idea, or not? H&N posted to KBC 11/15/09, KBC Comments, "To remind our readers, PCFFA, the Yuroks, and environmental groups petitioned in court against Klamath Irrigator's affordable power rate, irrigators lost, and now PCFFA and other environmental groups, the tribes, and government agencies have blackmailed irrigators..."
Here for Copco Lake website, one of the communities that will vanish with the removal of Copco Dam on the Klamath River. HERE for their great Virtual Tour. Historic state water deal now up to voters, Contra Costa Times, posted to KBC 11/6/09. "The package would require state residents to cut water use by an average of 20 percent over the next decade and, for the first time, require water users to measure and report their use of underground water, ending California's status as the only Western state that does not regulate ground water." Environmental dissent, (Oregon Wild, formerly ONRC) Group critical of water agreement, with KBC editorial, 10/30/09. "Why is it ok for Karuk spokesman Craig Tucker to help draft and support the KBRA, and with another affiliation Klamath Riverkeeper, oppose it?" Why do several supporters of the KBRA, including Tucker and Glen Spain of PCFFA, state: "Commercial agriculture within the national wildlife refuges should be phased out in an equitable manner and refuge lands should be returned to a natural habitat condition" ? Why do they tell the farmers otherwise? Water deal the topic of panel talk, H&N 10/25/09. KBC NOTE: apparently the public is not invited. Off-Project Resource Conservancy, representing 95% of off project irrigation, has not been invited to speak either. (*Two groups at the Klamath settlement table, NCEC and PCFFA, support taking out the Keno Dam as well. People at the Yreka meeting presented testimony objecting to dam removal. Most of those objecting are not allowed at the table. Eureka.) Dams and cattle, Looking over the dam removal agreement, (with informational links supplied by KBC) H&N 10/9/09. "Senator Whitsett...said he believes the agreements as written will pretty much destroy the cattle industry ..."
(Siskiyou) County: We have not approved dam removal, Siskiyou Daily News 10/8/09 Mixed views on dam removal, H&N, posted to KBC 10/8/09. "U.S. Rep. Tom McClintock, R-Calif. 'I think it’s absolute insanity,' McClintock said of the dam removal agreement." What you need to know about the KBRA, H&N 10/4/09. "...the public also will have the ability to comment on it, before it is signed..."
Klamath Riverkeeper's Press Release (threat of lawsuits), and KBC response. Some Klamath Basin Restoration Agreement negotiators are also Klamath Riverkeeper. National Research Council: Basin-wide study needed to assess water flows in Klamath, Siskiyou Daily News, posted to KBC 8/26/09 Siskiyou concerns are being addressed, H&N posted to KBC 8/25/09. "The unknown liability of millions of cubic yards of sediment behind the dams has kept Armstrong and her constituents strongly opposed to dam removal." Hukill: Group threatens recall over restoration agreement, by Klamath County Commissioner Cheryl Hukill, guest columnist, posted to KBC 8/7/09. KBC Responds Oregon GOP and dam removal, H&N 8/7/09. "...We oppose the breaching of dams and support additional storage sufficient to the needs of sound water management, hydroelectric power and environmental policy based on verifiable science..."
Klamath - GOP - Controversy grows over position on dam removal, H&N 8/7/09. "Whitsett said Tiernan wasn’t familiar with the state party’s platform and the fact that nearly every Republican in the Oregon Legislature voted against the dam removal bill was proof the party is united against it." Klamath Water and Power Agency board meeting 8/4/09. KWAPA will discuss becoming member of the closed-door KBRA/Klamath Basin Restoration Agreement. DOI NEWS RELEASE - Salazar: Klamath Basin Agreement “Within Reach;” Sets September Deadline for Final Deal on Potential Dam Removal, 6/30/09 (Klamath) Water issue divides GOP, H&N 6/27/09 followed by H&N reader comments. Health care, water hot topics; Senator speaks with Basin residents at town hall meeting, H&N, posted to KBC 5/28/09. Klamath Tribes, farmers make water settlement, Sacramento Bee 5/21/09, followed by Sac Bee comments. According to a Klamath Tribe document, the tribe intends to assert it's senior water right. Oregon Senator Doug Whitsett Newsletter 5/29/09. "The passage of SB 76 will start the process that will result in the largest dam removal since World War II, and the largest planned dam removal project in the history of mankind. It represents the first domino to fall in the destruction of the hydroelectric project and the implementation of the Klamath Basin Restoration Agreement. Incredible political pressure was exerted upon Oregon legislators to adopt SB 76, especially by governor Kulongoski and his staff. It appears that the dam destruction is an integral part of the Governor’s remaining legacy. This pressure was applied in spite of a recent poll of Klamath County registered voters that indicated overwhelming opposition to dam removal, and a recent poll of Oregon, Washington, and Idaho registered voters that indicated nearly identical overwhelming opposition to the destruction of the hydroelectric dams on the Snake River. " Farming For Wildlife, The Nature Conservancy, 2009. "This grant will sponsor an informational trip by some of the participating farmers and other agricultural stakeholders in the Skagit Delta to Tule Lake National Wildlife Refuge in the Klamath Basin region of Northern California." (Walking Wetlands will be part of the KBRA) Klamath Tribes, farmers make water settlement, KDRV 5/21/09. Video and article. "The settlement, filed Wednesday with the Oregon Department of Water Resources, mirrors key elements of the dam removal plan, under which the tribes agree not to use their senior water right to stop water for irrigation, and the farmers agree not to contest the tribes' claims. 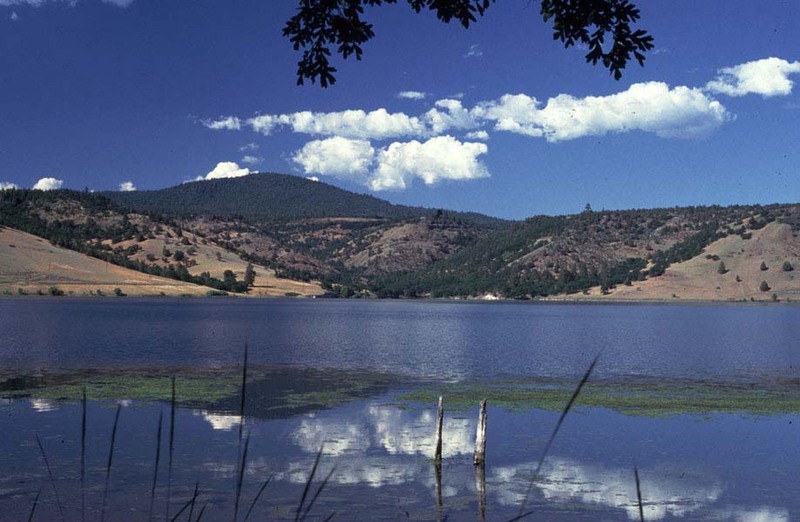 Klamath tribes have been fighting for senior water rights for close to 30 years." (KBC NOTE: Why can KWUA give away our water rights to the tribes? Our Electricity Deficit, parade.com posted to KBC 5/19/09. "The U.S. is barely generating enough electricity to meet current needs, and demand is expected to grow 26% over the next 20 years." Lawmakers want input about dam removals, H&N 5/16/09. Includes KBC Comments regarding the critics of the poll by our elected lawmakers. "We'd like to thank our lawmakers Garrard, Whitsett and Gilman for asking their constituents their opinion of: removing..."
Phone poll: (Klamath County) residents oppose (Klamath) dam removal, H&N 5/15/09 A resolution opposing portions of the proposed Klamath Basin Restoration Agreement, the KBRA, posted to KBC 5/15/09, by the Klamath County Republican Central Committee. Klamath dams debate roars on, Capital Press 5/14/09 Klamath-area farmer Tom Mallams showed lawmakers last week this stack of (1850) petitions opposing a plan to remove four Klamath River dams. Legislature Considers Funding For Klamath Dam Removal, OPB posted to KBC 5/9/09. "The measure would allow dam-owner PacifiCorp to put a surcharge on electric bills to pay for removing the dams." Dam issue all business; Removal may be best option for ratepayers, The Triplicate 5/9/09. "Currently, the dams only produce ... enough to power 70,000 homes." New Anti-Dam Group Part of "Well-funded, Well-Coordinated" Attack Against Snake River Dams, Congressman Doc Hastings, posted to KBC 5/8/09. Learning from the Dam-Removal Pros - featuring an author of the Klamath Basin Restoration Agreement, Interview with Craig Tucker, Klamath Campaign Coordinator, Karuk Tribe, International River, posted to KBC 5/2/09. HERE for Tucker's biography and related articles and letters. * Response to Channel 12's three-part series on the Klamath Basin Restoration Agreement news videos by Rex Cozzalio, Yreka, 5/10/09. * Comment of Channel 12's "reporting on the proposed Klamath Basin Restoration Agreement/KBRA, by Katherine Lehman, immediate past president People for the USA Grange 835. "If you had read the KBRA you would know THERE IS NO GUARANTEE OF ANY WATER TO ANY IRRIGATOR. The KBRA does, though, guarantee irrigators will lose water, and not just in the upper Klamath Basin." Northcoast Environmental Center steps away from Klamath agreement, Times Standard 4/24/09. "Greg King with the NEC said that efforts to submit changes to the working document were rebuffed. Signing onto the agreement in its current form, he said, could prevent the center from taking legal action to protect salmon in the river from depleted flows...Tucker also insisted that any group -- whether they sign the agreement or not -- can still assert its right to litigate to protect endangered species in the river if necessary." (KBC NOTE: we highlight Tucker's statement because up until now, the stakeholders have tried to convince the people, contrary to the settlement document, that the KBRA would end lawsuits and ESA demands on our irrigation water." PRESS RELEASE: How did we get here, CA Congressman Wally Herger, posted to KBC 4/23/09. "Let me say, without equivocation, that I have always been, and always will be a supporter of dams and hydroelectric projects. The benefits that they provide through clean, low-cost energy, flood control, water storage, local tax revenue, and recreation are invaluable". Group joins water discussion, Upper Klamath Water Users Association will have a vote, H&N 4/10/09. Merrill Townhall meeting with Klamath County Commissioners, 4/5/09 by KBC News -- notes and quotes about the Klamath Basin Restoration Agreement and a little background information. Off-Project Water Users call cops on Kandra at private board meeting, Board works to find water and power solutions for Off-Project farmers and ranchers March 24, 2009. Klamath proposal gains support in Legislature, Capital Press 2/12/09 Summary, comments end Camp, Dresser and McKee report, Siskiyou Daily News 2/24/09.